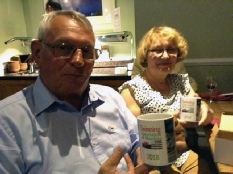 Edith and Bernard show off their new TAM Mumbles mugs. 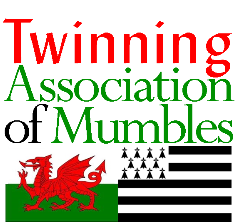 Several days of good company and friendship, with some old and some new faces on both sides, were enjoyed by everyone during an official visit to Mumbles from 17th-22nd June by a party of 15 from Hennebont, who stayed, as is the usual custom, in TAM hosts’ houses. This was despite four days of unseasonal cloudy and sometimes downright rainy weather, which settled on Wales in the middle of an otherwise warm and sunny summer just as our visitors arrived. But despite the grey skies, spirits remained high on all sides. The first official gathering was a dinner on Monday 18th June at the Mermaid restaurant, generously hosted by Jumelage Hennebont and also attended by guests from Ysgol Llwynderw and Bishop Vaughan School and Mumbles Community Council. Speeches in wobbly English and French were respectively made by the chairs of the two twinning groups. On a foggy and initially damp Tuesday 19th June the whole group split into two parties. One group visited first the South Wales Miners Museum in Afan Forest Park and then the Big Pit National Coal Museum in Blaenavon. 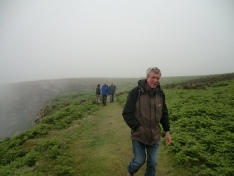 The other travelled to St David’s, Pembrokeshire for a fog-bound trip to Ramsay Island, followed by a three-hour walk on the island. Wednesday 20th June was hosted by Mumbles Community Council. First of the day’s events was a school assembly at Ysgol Llwynderw, where the pupils sang enchantingly and a group of children expertly displayed their clog dancing skills. Diolch i'r staff a’r disgyblion am y croeso ac i Cynghorydd Sara Keaton am drefnu'r ymweliad. (Thanks to the staff and the pupils for the welcome and to Councillor Sara Keaton for arranging the visit.) Then the group travelled to Clyne Gardens where the head gardener Teifion guided us expertly around several wonderful highlights,followed by a picnic lunch in the summer marquee near the Mumbles Road entrance. In the afternoon the Mumblers were soundly vanquished 3-1 by the Hennebontais in a pétanque rematch, and in the evening MCC hosted a dinner at the Copperfish restaurant by Mumbles Pier, which was also attended by some community councillors. The sun finally came out on Thursday 21st June for a day trip to Cardiff, which included art exhibitions at the National Museum, shopping and arcade strolling, and an open-top bus tour of the city centre and the bay area. In the evening we visited the outrageously ornate apartments of Cardiff Castle and finished up with a ‘medieval banquet’ in the castle accompanied by excellent singers and musicians and a fine booming line in Welsh jokes and humour. And a good time was had by all. A great leader strides forth from the Ramsay Island fog. Sarah and Ann perform in a bawdy Welsh song in Cardiff Castle. Castle.